If you have an email address, you can create your own username and password. 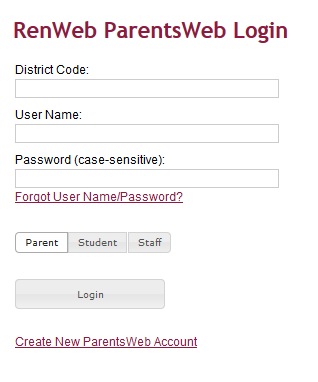 Parents can create their own login username and password if we have an email address on file for you. It will not accept an email address that has not been entered into the system. If you have been receiving email from the school, you should be OK. To submit an email address, click on the black "form" icon below. Please give us 24 hours to enter your email into the system. Then you can follow the directions below to create your login information. Go to https://logins2.renweb.com/logins/ParentsWeb-Login.aspx or click on the logo pictures on the right. Enter your email. An email will be sent to that email address giving the login information to complete the creating an account. All students will be accessible under the same parent account. Submit your email address here. If you have an email address but have not shared it with KSA, click on the black "form" icon on the left to submit it. Please give us 24 hours to get it entered into the system. ...you can still get a username and password through the office. Visit the page "No Email Address." If you need further assistance, please contact the school office at 801-486-0741 or email Mrs. Roy at proy@ksaschool.org.